Ninfa’s Green sauce is popular in many Mexican Restaurants down here in Houston. Ninfa’s was one of the first restaurants to serve this sauce. 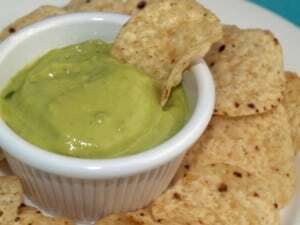 Ninfa’s Green Sauce is a creamy sauce with a touch of heat. Don’t miss trying out the Ninfa’s Green Sauce. You get it when you get your salsa and chips before your meal. Enjoy Ninfa's classic green sauce. Peel avocados and place them in a blender. In a medium saucepan, boil tomatoes, tomatillos, garlic, and jalapenos for 15 minutes. Remove from saucepan and place all ingredients in a blender with the avocados. Add sour cream and blend until smooth. The recipe I saw said 2 tbs olive oil when you boil the tomatillos,tomatoes, garlic and Jalapeno. It also says to let cool. Then throw that with the avocados and cilantro in a food processor. Then add sour cream. Not sure if that is the missing ingredient or not. Going to go try and whip some up now. I made this recipe and cut the sour cream back to about 1/2 a cup. It still has a slight sour flavor. Could this be the green tomatoes or tomatillos? Anybody? Sometimes fresh vegetables can vary in flavor. If something is a little extra sour, you can always add a touch of sugar to help offset the sour flavor. Thanks for the recipe but you are missing some of the ingredients. I received the ingredients from Gringos but they wouldn’t tell me how to or how much of the ingredients to use. What are the missing ingredients? Ninfa’s IS STILL a popular Mexican restaurant. I ate at one of many locations just yesterday. Trying to make some bucks on your book, are you? Shame on you. About 15 years ago there were many more of these than there are now. I think the chain lost its zing when Mama Ninfa sold the chain. Thanks for the recipe! Since moving to NE Louisiana it’s proven impossible to find good Mexican food. I made this as directed and it tasted too much like sour cream. Next time I will start with only 1/2 cup of sour cream and add more if necessary. Stephanie, I can’t tell you how long I have looked for this recipe. 🙂 You’ve made my day. I am so happy I could be helpful! This is great! I live in the Houston area and I’m so excited about trying this. I love the green sauce, it’s a must at Mexican restaurant.